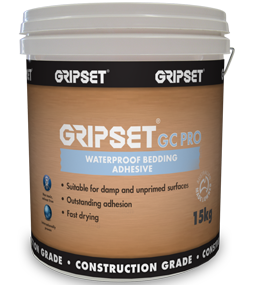 Gripset GC Pro Adhesive is a single part, waterproof bedding compound used for fixing the GC1 sheet system. Based on unique polymer technology, GC Pro Adhesive is suitable for use over porous surfaces providing excellent adhesion and fast drying properties. Applied by trowel to bed the GC sheet to the substrate, or by brush to install the Elastoproof bond breaker system, GC Pro displays outstanding workability and economical coverage. When used to fix the GC2 sheet system: 0.8m² per kg using a 3mm notch tooth trowel.